What do we so love about hand-made quilts, besides their lasting, cottony goodness? That they were stitched into harmony by someone who saw the potential for unity in a pile of fabric scraps. And mosaics? We love that someone gave new ‘life’ (as it were) to the beautiful, broken pieces of plates or glass or stone walls. Both quilting and mosaics began as crafts with utilitarian purposes and have been elevated to high art by some makers. Countless people from all walks of life have found these arts more accessible than painting, drawing, or sculpture, and achieved significant artistry. There are hundreds of active mosaicists and quilters in the Bay Area at levels from hobbyist to fine artist. The annual exhibit of the East Bay Heritage Quilters fills the gigantic Craneway Pavilion on the Richmond waterfront. There are also artists who do both. Block is one of 40 artists whose work will brighten the walls of the Institute of Mosaic Art (IMA) this summer in a fresh gallery show that showcases the dialogue between the two mediums. For “Textiles and Tesserae,” the IMA asked for submissions of mosaic or textile art that referenced the other in some way. Mosaics inspired by kimonos or ethnic weaves were suggested, or quilts inspired by mosaics. A ‘tessera,’ for the uninitiated, is a small piece of stone, tile, glass or other material used as the basic building block of a mosaic. Despite the fact that mosaics are a more ancient art than quilting, the general public has not necessarily kept up with the artistic evolution of mosaics in the 20th and 21st centuries. “In the U.S. we have a long tradition of quilting -- think quilting bees -- so I suspect that's why we have more quilters than mosaicists,” says Block. “In other parts of the world -- Italy, for example -- I suspect there is a much larger mosaic community because there is a long tradition of making mosaics. Those who do have a concept of mosaics often think of the folksy “pique-assiette” (broken plate) technique. But many contemporary mosaicists construct their work out of pristine sheets of stained glass, ceramic or glass tiles, which they cut to the needs of the particular piece. The diverse materials are rich in color, comparable to daubs of oil paint, and their arrangement can be as subtle as a brush stroke. “Pattern is important for both mediums and though one involves hard materials and the other soft, both are flexible enough to work with,” Bavor says. Inevitably, artists recognized that the spaces between the materials (“interstices” in the vocabulary of mosaics) were equally important elements of composition and they have become ever more so in contemporary iterations of these arts. “The grout lines in mosaics can be seen as parallels to the stitching, or lattice, of textile art,” Bavor confirms. The exhibit at the IMA, comprised of about 42 individual pieces, demonstrates the many ways in which this motif can play out. One large, vibrantly colored quilt called “Cinco de Mayo,” by award-winning quilter Betty Thurman, was reimagined as a mosaic (“Cinco de Mayo in Glass”) by her daughter, Jan Ghilaine Wolfe. Both works serve as centerpieces and counterpoints to one another in this show. Deborah Block also offers two works (“Color Blocks #1 and #2”) inspired by quilting patterns, one in fabric and the other in smalti, which are tiny, hand-cut cut cubes of densely color-saturated glass. As with many of the contributors, mosaicists Jill Stevenson-Ritter and Amelia Williams were inspired to create new works expressly for this show. “I have wanted to do a mosaic prayer rug for some time so the Textiles and Tesserae show was a good prompt,” says Williams. While Williams is not Muslim, she once spent time in Indonesia and was moved by some of the cultural practices of the Muslim world. “I like the whole idea of the call to prayer, the idea that the divine calls out to us, to humanity, and we respond to it. 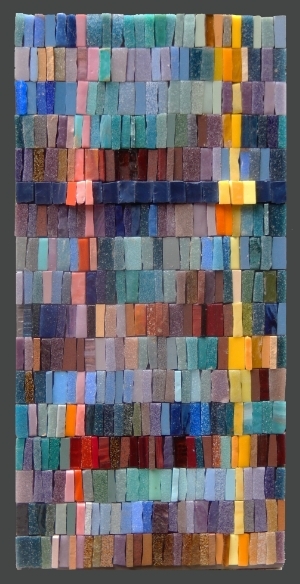 In my mosaic I want to portray the prayer rug as our response to that invitation,” she says. Her intricate and ambitious piece, aptly titled “Call to Prayer,” depicts a rug still on the loom, with a three-dimensional aspect where the bottom of the rug curls up. She recently learned that technique at a workshop with Australian mosaic artist Marian Shapiro, at the Society of American Mosaic Artists conference in San Diego last April. The challenges of representing the flowing qualities of textiles in the solid materials of mosaic were familiar to Jill Stevenson-Ritter, a longtime instructor at the IMA. Her piece for this show, “Chinese Silk,” is a beautiful 12-by-12-inch gem in chocolate browns, golds, and purples. For technical reasons she had to simplify the Chinese symbols seen in the piece of fabric that inspired her: ‘translation’ required innovation. And whereas the silk was shiny throughout, she chose to use matte ceramic tile as a background in order to offset the reflective gold and purple flowers: it works. Another piece by Stevenson-Ritter was inspired by Panamanian molas, a traditional fabric art made with a reverse appliqué technique. While most of the pieces in the show are exemplary works of either mosaic or textile art, Keenan Saiz’ “Ripple Effect on the Spiritual” is a cyanotype (photographic) print on silk, stitched to simulate mosaic tiles. It’s an intriguing hybrid. "Textiles and Tesserae" will be the final gallery exhibit at the Institute of Mosaic Art, which is to close its doors by the end of August. The show opens July 9 and will close with a grand finale party the evening of August 21, from 4-7 p.m., with many artists in attendance. The Gallery is open Fridays, Saturdays, and Sundays from 9:30 a.m. to 5:30 p.m. at 805 Allston Way, in Berkeley. Entrance is free. Please join us! NOTE: The IMA will be closed for July 4th weekend.